Explore Royal Palm Yacht and Country Club homes for sale in Boca Raton, Florida below! Located along the Intracoastal Waterway on some of the most pristine real estate in South Florida, Royal Palm Yacht & Country Club offers some of the most exclusive luxury homes in the country. Royal Palm Yacht and Country Club real estate exists in a private, member’s only club community in East Boca Raton and offers a stunning range of homes that cater to the elite homebuyer. Offering both waterfront and golf course residences, Royal Palm Yacht & Country Club homes for sale provide the ultimate in South Florida luxury and exclusivity. In the current active listings for the Royal Palm Yacht estate market, the highest home price is $	with the lowest available property listed at $. The average price for homes in the Royal Palm Yacht	community is $	with a median price of $4,450,000. Royal Palm Yacht	homes for sale range in size from Sqft	to Sqft	with an average lot size of acres. Royal Palm Yacht estate appeals to a wide range of homebuyers in the area. Royal Palm Yacht and Country Club real estate was first developed in 1959 with the intent of being known as one of Boca Raton’s most exclusive and desirable luxury communities and over the years it has more than lived up to that expectation. Homes in this stunning community range from original 1960s homes around the $1-million mark to newer grand luxury residences directly on the water for well over $10-million. These sprawling estates feature high-end luxury details including marble floors, vaulted ceilings in grand foyers, custom designed and built wine cellars and massive gourmet kitchens that any professional chef would be proud to cook in. Exteriors provided stunning lush tropical landscapes with private pools and spas and outdoor kitchens; perfect for year round outdoor entertaining. 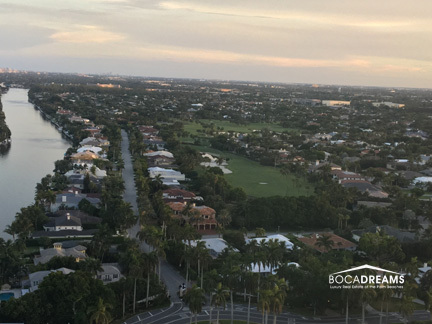 Living in Royal Palm Yacht & Country Club properties have all the perks that one would expect from the most sought after and desirable communities in Boca Raton. Membership at the club is not mandatory but definitely has its privileges including access to the deep water marina, tennis courts, a full-service fitness facility, swimming pool and the world-class championship golf course. Residents of Royal Palm Yacht and Country Club real estate enjoy quick access to world-class shopping, restaurants, galleries and entertainment at both Mizner Park shopping area and Royal Palm Place. Didn't find what you were looking for in Royal Palm Yacht & Country Club real estate? Fill out the form below and let your Boca Raton dream property find you instead!